You will earn 42 Reward Points. Earn 1 reward point for every 1 dollar spent. 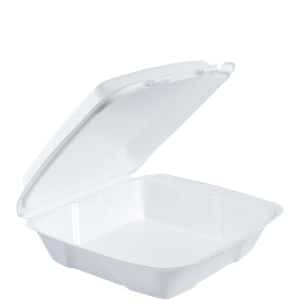 Convenience is the key with Dart foam hinged lid containers. Secure closure improves handling and helps protect against accidental openings. High insulation qualities make them ideal for transporting and storing both hot and cold foods. Carryout service wouldn't be complete without them. Twelve popular sizes of Dart foam hinged lid containers feature the Performer perforated hinge. This one-of-a-kind feature allows the container's lid to easily be removed, making for a less cluttered dining experience and providing an extra plate for meal sharing.